Specify the SAS library where the activities data set is stored. Sort the activities data set by the variables containing the calendar identification and the starting date, respectively. Set the FORMCHAR option.Setting FORMCHAR to this exact string renders better HTML output when it is viewed outside of the SAS environment where SAS Monospace fonts are not available. LINESIZE needs to be set in this example to prevent truncating data in the output. Create the summary calendar. DATA= identifies the activities data set; HOLIDATA= identifies the holidays data set; CALDATA= identifies the calendar data set; WORKDATA= identifies the workdays data set. DATETIME specifies that the variable specified with the START statement contains a SAS datetime value. LEGEND prints text that identifies the variables. Print each calendar on a separate page. 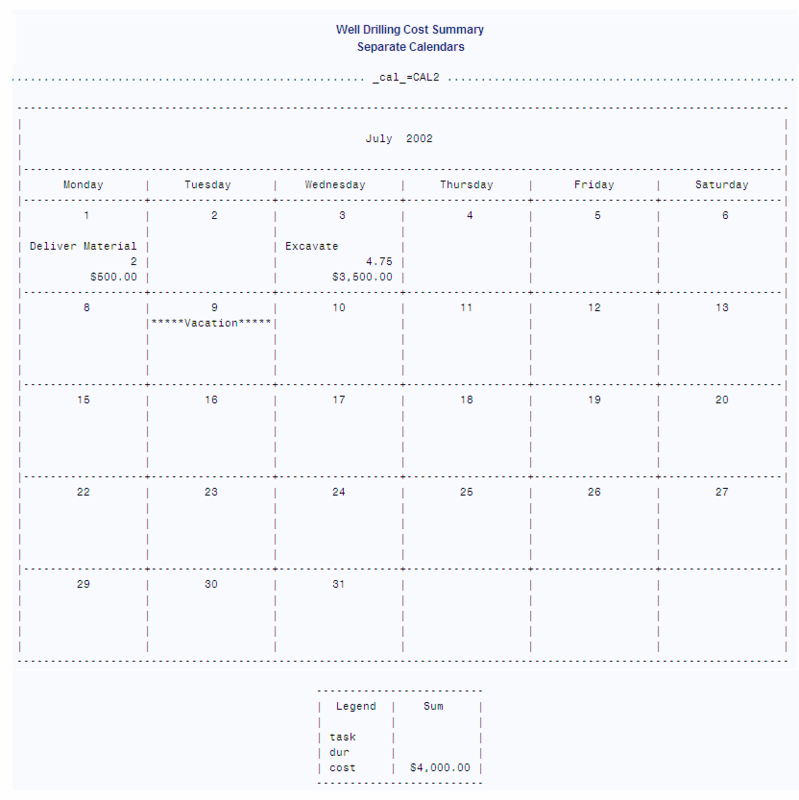 The CALID statement specifies that the _CAL_ variable identifies calendars. OUTPUT=SEPARATE prints information for each calendar on separate pages. Specify an activity start date variable and retrieve holiday information. The START statement specifies the variable in the activities data set that contains the activity starting date. The HOLISTART and HOLIVAR statements specify the variables in the holidays data set that contain the start date and name of each holiday, respectively. These statements are required when you use a holidays data set. Calculate sum values. 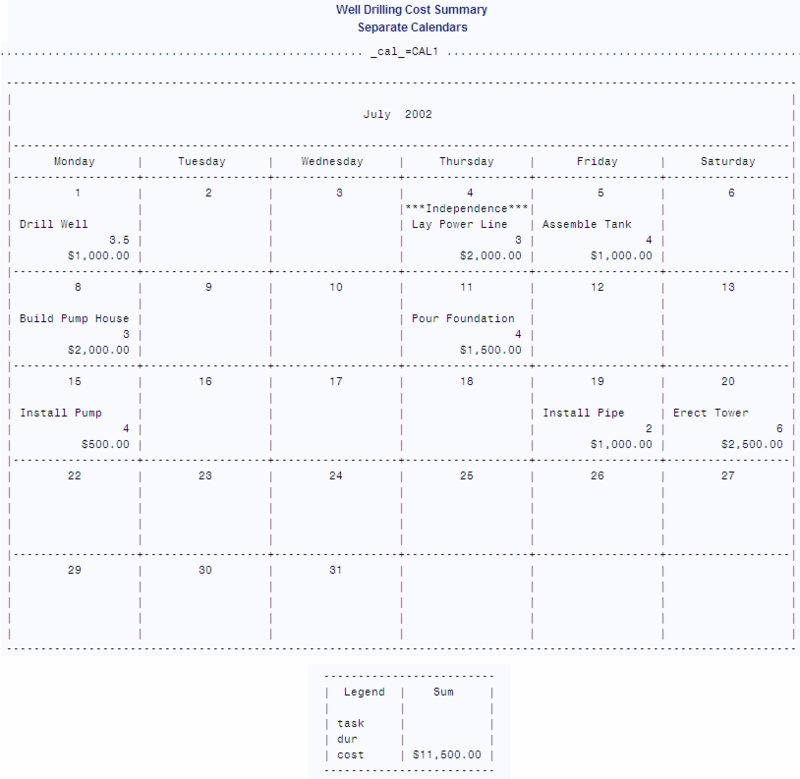 The SUM statement totals the COST variable for all observations in each calendar. Display a 6-day week. OUTSTART and OUTFIN specify that the calendar display a 6-day week, Monday through Saturday. Specify the titles and format the Cost variable.